The RV Doctor: Winterize Using A "Schrader Valve?" Winterize Using A "Schrader Valve?" Bobbie, the device you are seeking that incorporates a Schrader valve is called a blowout plug. 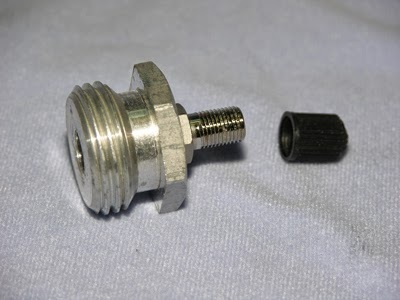 It has the air inlet valve (Schrader valve), on one end and a male hose fitting on the other end. Mine is made out of milled aluminum, but I've seen brass blowout plugs as well as inexpensive plastic blowout plugs. I do recommend the metallic type. The blowout plug attaches directly to the city water inlet hose connection, but only temporarily; it isn’t a permanent installation. Clean compressed air is then forced into the system to expel the water through the faucets and low point drain locations. It’s the quickest way to rid the fresh water system of water. Professional shops use them all the time while performing winterizing procedures or when any time an RV is going to be stored for any length of time. As you drain the fresh water tank and water heater, attach the blowout plug to the city water inlet. Open all faucets plus the hot and cold low level drain valves and then inject clean air. You can certainly apply more than 20-PSI since the entire piping system is pressure-tested at 80-PSI at the factory. And since all the faucets and valves will be open, it will be safe and quicker to use 80-PSI. Be sure it is clean air! Like I tell my seminar attendees, this is your fresh water system! Avoid using gas/filling station air or any air from a compressor equipped with a tank. The chance of contamination is greater if the compressor has a storage tank. In addition, pour a 1/4-cup of RV anti-freeze down each drain to fill the P-traps and you should be set for winter or any period of non-use. You can purchase a blowout plug at any RV dealer or service center’s parts and accessories department and many websites online.